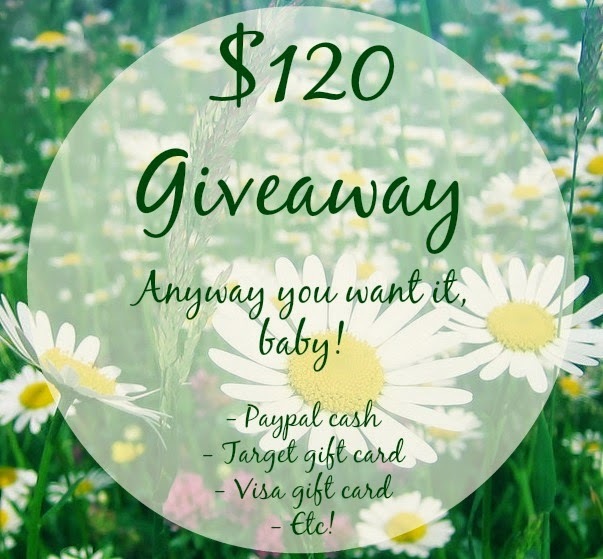 Finding My Virginity: Spring Fling Giveaway! Show Me Some Love and Win You Some Cash! Spring Fling Giveaway! Show Me Some Love and Win You Some Cash! If you're a big fan of Bonnie at Life of Bon, you might have noticed my brand-new, married-person button on her sidebar. I had the chance last year to buy a month's worth of advertising at a discount, and I quickly snatched up one of her May spots! My husband doesn't realize the amount of money I spend on my blog, but it's way less than he spends on his Miata, so I think we're even. I teamed up with some of her other sponsors to give one lucky reader $120. Since you're already reading my blog, you probably have some easy entries that don't require doing much! Bonnie did make it mandatory to like her facebook page, but that's still really easy. And when I enter giveaways, I use my blog page to like other blogs. It keeps my personal facebook personal, and my blogging one bloggerific! Most of you already follow me on Twitter... But have you liked me on Facebook yet? And even though Bloglovin has attempted to silence me, my blog does still exist there, and you can gain an additional entry in the giveaway by following me on Bloglovin. I'm hoping that if I can get my numbers up, they might be more inclined to whitelist me. i follow you on all the things! !